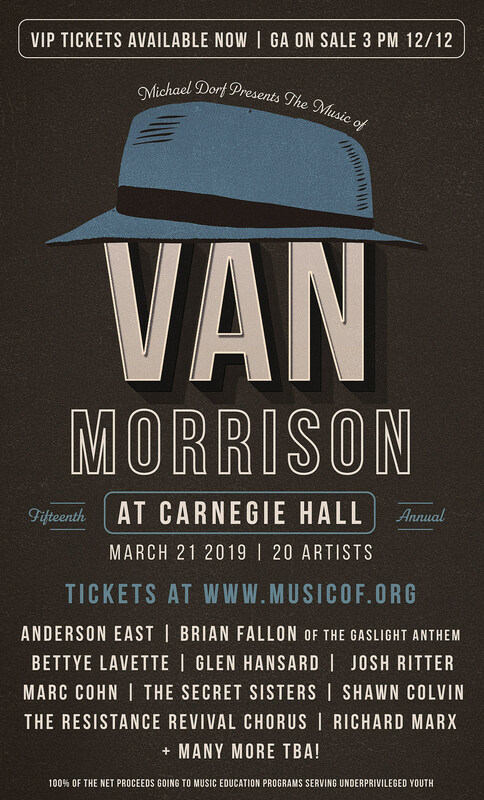 As recently mentioned, Knitting Factory/City Winery founder Michael Dorf‘s annual tribute show will honor Van Morrison in 2019, and it goes down March 21 at Carnegie Hall. The initial lineup has now been announced, including The Gaslight Anthem’s Brian Fallon, Glen Hansard, Bettye LaVette, Josh Ritter, Marc Cohn, The Secret Sisters, Shawn Colvin, Anderson East, The Resistance Revival Chorus, Richard Marx, and more TBA. General admission tickets go on sale Wednesday (12/12) at 3 PM, and various VIP packages are on sale now.